– CoreSwitch should be the root bridge for VLAN 20, but currently DSW1 is the root bridge for VLAN 20. – Traffic for VLAN 30 should be forwarding over the gig 1/0/6 trunk port between DSW1 and DSW2. However VLAN 30 is currently using gig 1/0/5. – Traffic for VLAN 40 should be forwarding over the gig 1/0/5 trunk port between DSW1 and DSW2. However VLAN 40 is currently using gig 1/0/6. You task is complicated by the fact that you only have full access to DSW1, with the enable password cisco. You are allowed and provided only limited show commands access is provided on CoreSwitch, and DSW2 using the enable 2 level with a password of Cisco. You are not allowed to made configuration changes on these Switches. Also you don’t have access to ASW1 or ASW2. So you are only limited to make configuration on DSW1. 1. “CoreSwitch should be the root bridge for VLAN 20. DSW1 is currently the root bridge for VLAN 20″ our task to make CoreSwitch the root bridge for VLAN 20. For making the CoreSwitch as a root bridge we need to assign the lowest priority value for VLAN 20 on CoreSwitch, but we are not allowed to make changes on this Switch we have only access to DSW1 therefore we can increase the priority of DSW1 so that it become higher than CoreSwitch. For this use the “show spanning-tree” on CoreSwitch and on DSW1 for checking the priority of both switches for VLAN 20. Currently DSW1 is the root bridge for VLAN 20 (notice the line “This bridge is the root” on below figure). To make the CoreSwitch the root bridge we need to increase the DSW1′s priority value, the best value should be you can use another value but make sure it is higher than the CoreSwitch priority value by checking if the CoreSwitch becomes the root bridge or not; and that value must be in increments of 4096. 2.“Traffic for VLAN 30 should be forwarding over the gig 1/0/6 trunk port between DSW1 and DSW2. Notice that we only need to change this value for VLAN 30, not for all VLANs. “3. Traffic for VLAN 40 should be forwarding over the gig 1/0/5 trunk port between DSW1 and DSW2. However VLAN 40 is currently using gig 1/0/6″ and our task is to make the forwarding of VLAN 40 through gig 1/0/5. It is a similar job, but we are not allowed to make any configurations on DSW2, and in this case we can’t change the port-priority for VLAN 40. There is another solution for this you can change the cost (set the lower value) on an interface of DSW1 then only DSW1 will learn the change. – Users connecting to ASW1’s port must be authenticate via a Radius server before they are given access to the network. The radius server address is 172.189.29.100 and Radius key is ciscoradius. – Devices on VLAN 20 are restricted to in the address range of 172.120.10.0/24 and packets from devices in the address range of 172.120.10.0/24 should be passed on VLAN 20. – Packets from devices in any other address range should be dropped on VLAN 20. And this filtering should be configured as close to the server farm as possible. Packets from devices in the address range of 172.120.10.0/24 should be passed on VLAN 20. A company has added two new layer3 switches, one will act as distribution-layer switch while other will play the role of access-layer switch as shown in figure. 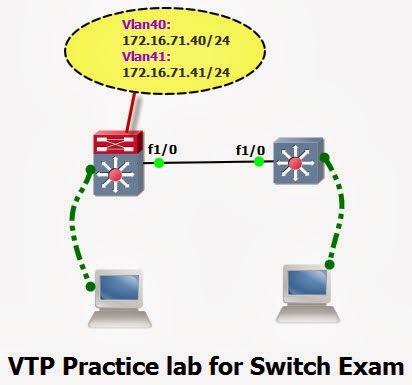 You task is configure VTP (vlan trunking protocol) to distributing the VLAN information distribution-layer switch to the access-layer switch. 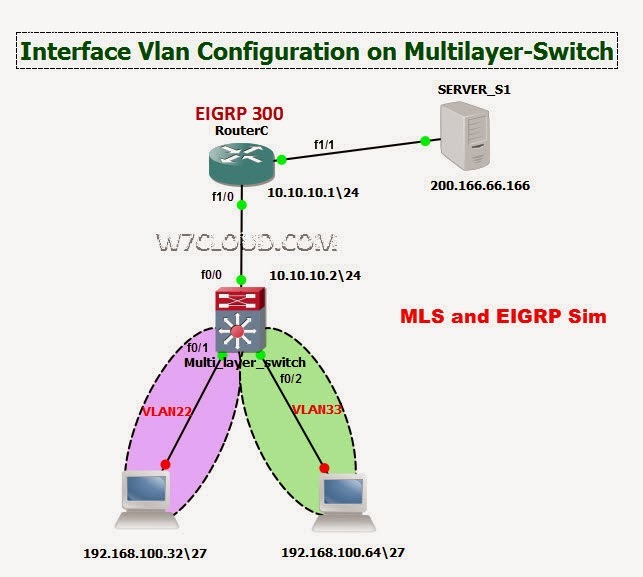 Also configure interVLAN routing on the distribution layer switch to route traffic between the different VLANs that are configured on the access-layer switches; however, it is not compulsory for you to make the specific VLAN port assignments on the access-layer switches. 5. Specific VLAN port assignments will be made as users are added to the access layer switches in the future. Note: All VLANs and VTP configurations are to completed in the global configuration of Switch.